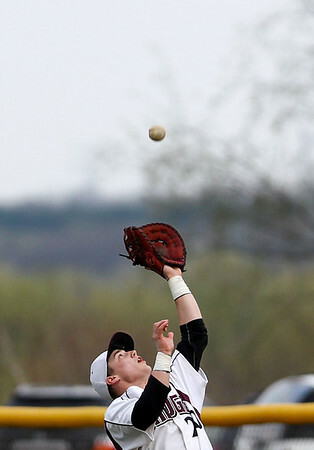 Jenny Kane - jkane@shawmedia.com Prairie Ridge's first baseman Mike Hallstrom catches a pop-fly during the top of the third inning in their non-conference game against Fremd. Prairie Ridge lost to to Fremd 9-10. 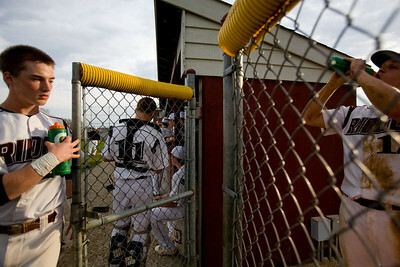 Jenny Kane - jkane@shawmedia.com Prairie Ridge varsity baseball team grabs a drink while they prepare to go to bat against Fremd during a non-conference match-up. 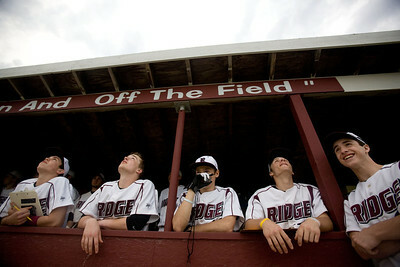 Prairie Ridge lost to Fremd 9-10. Jenny Kane - jkane@shawmedia.com Prairie Ridge's certified athletic trainer Mary Miller cuts Kyle Hodorowicz's torn pants during their non-conference match up against Fremd. Jenny Kane - jkane@shawmedia.com Prairie Ridge's first baseman Mike Hallstrom tries to make a pick off against Fremd's Danny Haduch during their non-conference game. Prairie Ridge lost to to Fremd 9-10. Jenny Kane - jkane@shawmedia.com Prairie Ridge's Connor Perry tries to make a pick off against Fremd's Danny Haduch during their non-conference game. Prairie Ridge lost to to Fremd 9-10. Jenny Kane - jkane@shawmedia.com Prairie Ridge's coach Glen Pecoraro gathers his team together before they go up to bat during the fourth inning in their non-conference game against Fremd. 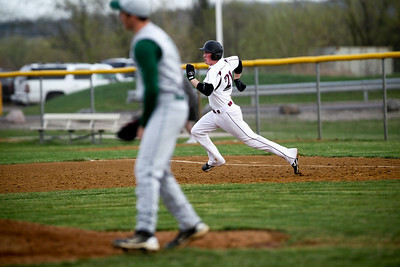 Jenny Kane - jkane@shawmedia.com Prairie Ridge's Bryan Klendworth runs to second base after hitting a double during their non-conference game against Fremd. Prairie Ridge lost to Fremd 9-10. Jenny Kane - jkane@shawmedia.com Prairie Ridge's dugout watches pop-fly hit over left field go out of bounds during their non-conference game against Fremd. Prairie Ridge lost to Fremd 9-10. Jenny Kane - jkane@shawmedia.com Prairie Ridge catcher Matt Krenz tries tag Fremd's Josh Jyawook out as he tries to steal home during the top of the second inning in their non-conference match-up. Prairie Ridge's Bryan Klendworth runs to second base after hitting a double during their non-conference game against Fremd. 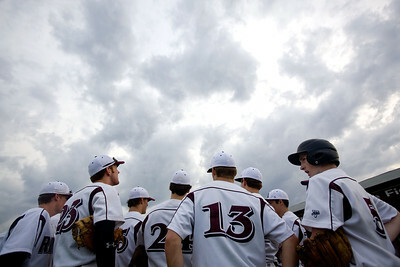 Prairie Ridge lost to Fremd 9-10.